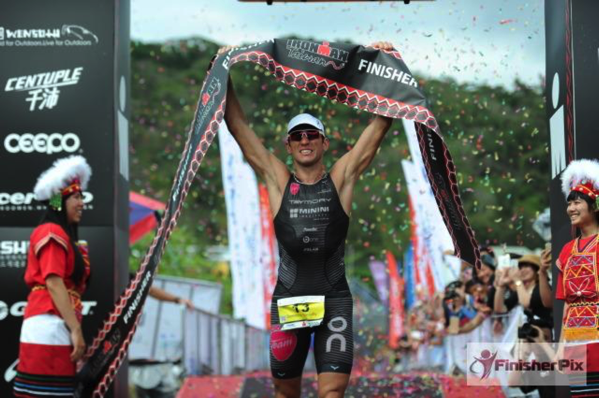 This was the first time for a full-distance Ironman-branded race in Taiwan. The typically hot conditions and the hilly bike course did not allow for fast times, a race adjustment of 8:37 is similar to Switzerland or Mont Tremblant. Ex-Pro bike racer Domenico Passuello exited the swim two minutes after early leaders Rod DeKanel, Fredrik Croneborg and Cam Brown. He quickly rode up to them, then built an eight minute lead into T2. After a solid 2:55 marathon he continued his winning streak (he won 70.3 Putrajaya a week ago), but still needs another 1.100 points for a Kona slot. The race best marathon (2:49) allowed Fredrik Croneborg to finish second – again coming up just short of a win (he was also second at IM Malaysia), but he is now safe for a Kona slot. Third place went to Patrick Evoe who had to play catch up all day after a slower than normal swim. Cam Brown said after the race that he had „nothing in the tank“, he still finished fourth and now also has a safe Kona slot. It was almost six years ago that Dede Griesbauer won IM Brasil in 2009. 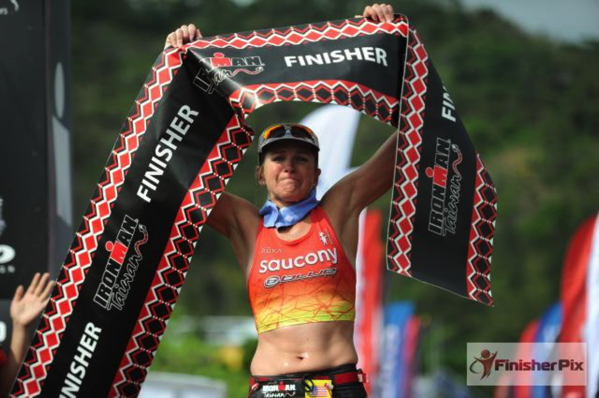 She went through a long period of dealing with injuries sustained after crashing at IM Germany 2011. At 44 years of age, she is now back on full form: She finished second at IM Mallorca and also won her first 70.3 at Taiwan at the end of 2014. She’s had another great race in Taiwan: Close to the front at after the swim, then quickly building a lead on the bike, and finishing off her race with a 3:17 marathon to win by more than ten minutes. Second place went to Dimitry-Lee Duke who had the strongest marathon. Kim Schwabenbauer took third spot, posting a new swim PR just over an hour, had a solid bike, but then didn’t quite have the run she was probably hoping for. Because there are fewer WPRO slots for Kona, they need more points and none of the Taiwan athletes has enough points for a safe slots.